Today was my last day off. I got up and made myself some steel cut oats with peanut butter and cinnamon apples. Then I had to hit the grocery store so I could have something to eat for lunch. I should have gone to Target and Whole Foods too, but that just wasn't going to happen. When I got home and the food unloaded, I headed up to my little gym for legs. I did 3 sets of 8 reps using the same slow 2:6 rep count that I used yesterday (with the exception of step ups and calves). I followed this up with Shock Cardio MMA Boxing and a stretch. I had planned on doing abs too, but sort of ran out of steam. After my workout and lunch, I decided to lounge in the pool for a bit. It was HOT out, so I didn't stay out long. Plus, I really did need to finish up with chores. Jason was great and vacuumed the area rugs for me. I had some more clothes to put away; I really take my time unpacking! I did get a super great package today. I love getting goodies in the mail. This package came from Jill @ My So Called Health Life. It was a box of KIND bars! I won them from her recent giveaway and can't wait to dig in to one. I'll be sure to post my review on them. Check out the site for nutritional information. I really wanted to grill out, but I also wanted to honor my Mexican Monday ritual. I decided to try a Grilled Chipotle BBQ Tofu Quesadilla. In the end, I also had to try my hand at making my own BBQ sauce for the first time. Once I got going, I realized I didn't have enough BBQ sauce on hand. Ooops. Note to self: always check the ingredients on hand before starting a meal. I searched online through many BBQ sauce recipes. In the end, I took bits and pieces and made my own: Heather's Chipotle BBQ Sauce. In small sauce pan, saute onions and garlic until onions are completely soft. Add in remaining ingredients and let cook down until flavors begin to meld. Re-season if needed. 1 package of extra-firm tofu (frozen, thawed, squeezed). Cut tofu into slabs and marinated with BBQ sauce for approximately 2 hours. Grill tofu until crisp then dice. In sauce pan saute onions, bell peppers, and garlic until soft. Then stir in the beans and spices. Let cook until beans soften. Lightly mash. Place tortilla on grill and lightly grill one side then flip. Spread BBQ sauce on tortilla, top with cheese (optional). On one half top with tofu and bean mixture. Fold over the other half and grill both sides until crisp. These turned out really well. We topped them with more BBQ sauce. I think I may also try this with a BBQ sauce marinated seitan and top with a cabbage and carrot slaw. Enjoy those bars, they look yummy! Those quesadillas sound ridiculously fantastic! You can do so many unconventional things with the quesadilla in general. Like risotto quesadillas, mmm. And my crazy college roommate would make BACON quesadillas which were a heart attack but I'd have the occasional bite and they were awful tasty. 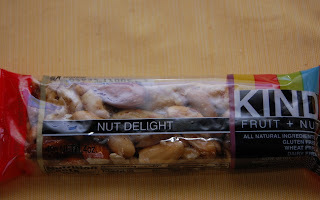 I loove KIND bars! So many good varieties. And I am a huge bbq sauce fan so I'm guessing I would demolish your quesadillas! the bbq sauce looks great...yum!!! I always see those Kind Bars staring at me when I'm in line at Starbucks and I'm always tempted to give them a try. I think they'd make a great post-workout treat. I really like Kind bars. I don't care for many BBQ sauces, but yours looks like a great one that dare I say..may convert me to a BBQ sauce lover! Ooohhh...I bet that slow rep count kills! And I think it would be funny if you tried to do it with stepups. LOL That would take serious balance and I know I would topple over quite easily. That quesadilla looks ballin! I am the kind of girl that can literally eat bbq with a spoon so I'm totally stoked to get a recipe for it! I have no idea why I never thought to make it from scratch before? You are a genius. great recipes! 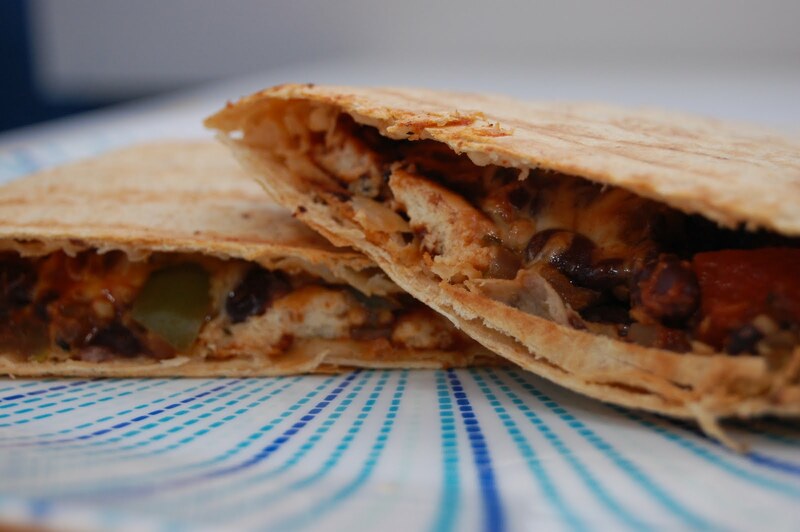 I love quesadillas and might try yours out soon! Enjoy the Kind bars...we love them!!!! i love how you have mexican mondays and pizza fridays! so festive and fun........oh so love kind bars. haven't "energy" bars gotten so much better than they used to be? love yummy mail and LOVE KIND bars! enjoy! Bela @ It's Life, Max it Out I'm afraid they're going to be too yummy if you know what I mean! Lisa @ Lisa's Foods on the Move I swear it was like Christmas for me opening the package. Candice @ ChiaSeedMe I've been wanting to try to make my own sauce for ages. The bottled stuff usually has so much sugar. This definitely forced me to do it! Lele @ Lele Lurves Plants I agree that quesadillas are unbelievably versatile. Really, you could eat them every day! Megan @ The Oatmeal Diaries I've heard great reviews about the KIND bars, just never wanted to pay for them LOL. I love bbq sauce too. It's great on veggie burgers. Kelly @ Healthy Living with Kelly I think it'd be fun to have a sauce shop. I love condiments! Averie @ Loves Veggies and Yoga I'm cheap too! Joanna Sutter @ Fitness & Spice I agree on the post-workout or perhaps a snack traveling. Lindsay @ Pancakes N Pajamas I typically enjoy most bbq sauces (just have to watch the ingredients being vegetarian). Let me know if you ever try this one out. Tina @ Tina Bit of Faith Fitness and Fun OMG - step ups with that count - OUCH. There was no way I was going to even pretend to attempt! Alycia @ Fit n Fresh Thank you ma'am! I'll take genius LOL. I don't know that there are any MMA classes around here. I just use my DVDs. Lots of fun. Kenzie @ A Healthy Purpose Let me know if you try them out and if you like the combo. I think it would work well with a bbq seitan instead of the tofu too. Kelly @ Healthy Living with Kelly Something tells me I will! Kalli @ Fit and Forty Something Sometimes I think it might be a wee bit silly, but it can also narrow down dinner ideas!!! ;-) Oh man I remember the first energy/power bars - ick! Eunice @ Food 4 Fitness Isn't it funny the number of people that eye them but haven't tried them yet??? Shannon @ The Daily Balance Yummy mail is the best kind (other than perhaps clothes or money). I am so making quesadillas soon with Daiya...that is on the menu! Yours look delicious! Sarena @ The Non-Dairy Queen I can't wait to read about your quesadillas! Love the BBQ sauce recipe! Kristine @ Busy But Healthy If you ever try it out, I'd love to hear your thoughts! Well apparently I just completely jumped over this post! haha. Glad you got them! I bought 2 Nut Delights at the store tonight actually. Can't wait to hear what you think! Jill @ My So Called Healthy Life I should have emailed you and let you know I got them! My husband took several to work and has been snacking on them. I finally tried a bite the other day and need to post that (thank you for the reminder). Thanks again!